Only a couple centuries ago, if somebody claimed they could hold lightning in their hand to fuse steel, they would stand a pretty good chance of being burned at the stake for witchcraft. Luckily, things have changed. 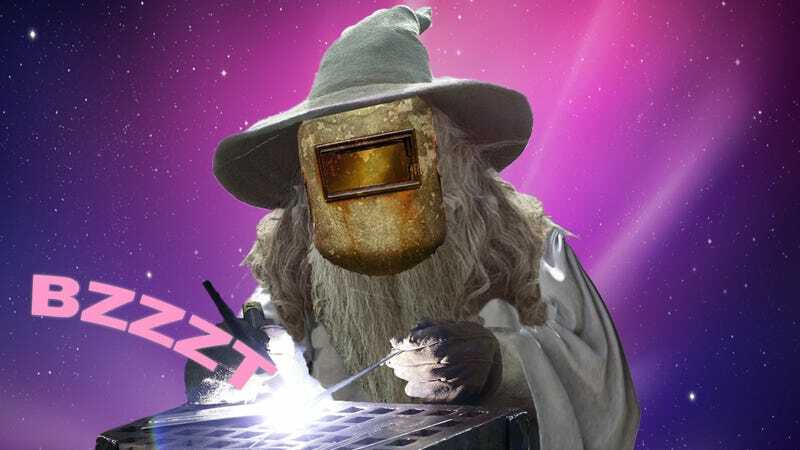 Welding has been around since the bronze age. At its most basic, welding is the process of heating two pieces of metal to the point of melting at which time they fuse. So when you weld you aren’t “glueing” metals together like soldering does, you’re actually using heat to make two pieces one, and that’s pretty dang cool. There are tons of ways to weld. There’s forge welding, where metal is heated and then beaten or pressed together. There’s oxy-fuel welding, which uses a blow torch to heat the metal and filler rod. There’s even a process called explosion welding. Discovered during World War I, it was found that hot shrapnel was actually fusing itself to armor plating. Which is neat, but also horribly violent. But once you know how to weld, a world of possibility opens up. Need some awesome bumpers for your truck? Learn to stick weld and build them yourself. How about replacing rusty rocker panels or chopping the top on your car? You can do it yourself when you learn to MIG weld. Need a complicated aluminum intake for your cold air system? Learn to TIG and make it yourself. Arc welding uses an electric arc to heat metals to their melting point. It’s been around since the late 1800’s, when a French scientist was searching for a way to join lead plates for use in batteries. The process didn’t get hot enough to melt steel, but it wasn’t long before it was possible to fuse steel with the power of electricity. The advent of electric arc welding literally changed the world. Before the Industrial revolution, manufacturing was limited to what could be forge welded or mechanically fastened together. The ability to safely and predictably fuse steel to create a permanent bond enabled buildings to be built taller, ships to be built bigger, and cars to be manufactured on a mass scale. 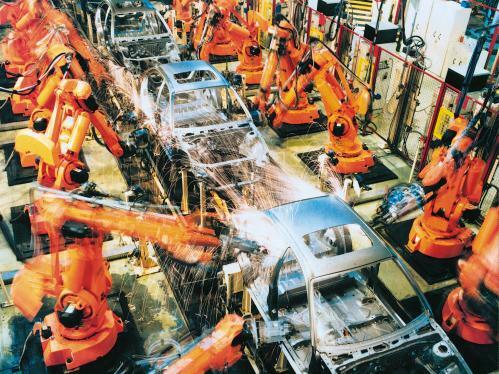 Today’s cars have literally thousands of spot welds holding the chassis and body together. But today, we’re just going to focus on three popular types of electric arc welding, known as stick, MIG and TIG. Stick welding, also known as shielded arc welding or just arc welding, was introduced at the turn of the 2oth century. This process uses a flux covered wire, or electrode, to complete a circuit between the grounded material being welded and the charged welding torch. Flux is a coating is burned away and forms a gas shield around the arc and the weld as the electrode melts. This gas shields the metal from oxidizing or burning. Burning the flux leaves a layer of “slag” on the weld that protects it as it cools. This slag must be chipped off with a hammer and wire brush. There’s a trick to getting the arc started. You have to just graze the electrode against the surface of the metal and then pull back. But don’t pull back too far or you’ll break the arc. You also can’t linger more than a split second or you end up sticking the electrode to your project. A competent welder makes it look like child’s play. I fall into the camp that sticks the electrode to the work piece or falls to maintain an arc then cusses and gives up on stick welding forever. But hey, that’s just me, some folks love this stuff. Stick machines are about the cheapest way to get into welding. The only consumables are electrodes, making it an inexpensive and easy way to start sticking metal together. It’s also dramatic and messy. It looks good in the background of movies because of all the smoke and sparks. It’s also good for starting grass fires. The redeeming quality is its simplicity and accessibility. It’s best use is for projects like trailers and fences where you can knock the slag off and lay on some paint. Or lots of guys keep a battery welding set up on their 4x4s for emergency trail repairs. These can get pretty elaborate, but you really can weld with just some batteries and some jumper cables. If you’re itching to get out and try it yourself Harbor Freight sells these for under a hundred bucks, or you can make your own. MIG, or Metal Inert Gas, welding is a sort of do-all welding. A person can get set up to MIG weld fairly inexpensively and the learning curve isn’t overwhelming. If you can pull a trigger, you can do this. But, like anything else to getting really good at, it takes practice. When the trigger is pulled on a MIG welder it feeds a consumable wire through a gun that both charges the wire, and shoots out a mixture of inert gasses. The gas is stored in a bottle connected to the welder and typically is a mix of argon and carbon dioxide. The two gases offer a cleaner way of protecting a weld than burning flux does. The operator sets the amperage and wire feed speed best suited for the material they’re going to weld. It’s such a satisfying feeling when the machine is dialed in, and you get an even sizzle sound that accompanies a good weld. MIG is sometimes referred to as “wire-feed welding,” which is technically correct, but not all wire-feed welders are MIG. Some machines use flux-cored wire, which is like a stick welding electrode turned inside out, and creates a gas to shield the weld as it’s burned up. The machine I use at home is a small MIG set up I got on sale at a home improvement store around the holidays, and I got my helmet at Harbor Freight. It’s a 120-volt model, which can’t weld material as thick as a 240-volt machine can, but it is more convenient. I managed to replace the rusted-out floors in my old car with new floorboards by myself, with practically no experience when I started. Though MIG machines have the added expense of shielding gas, are more complicated, and generally have a higher initial cost, they really do offer superior results with less mess and in less time. They’re really versatile and some machines can even be set up to weld aluminum. Oh, and there’s a slightly lower risk of setting yourself on fire, but I keep a fire extinguisher handy anyway for such trivialities. If stick welding is the sledge hammer of welding, all unwieldy and a little awkward for finesse work, and MIG is a ratchet wrench, pretty universal and effective, then TIG welding must be a scalpel. It can do it all, but really shines in situations that require a little more precision. It offers the cleanest welds and the most control. It couldn’t be simpler on paper, but it manages to be complex and elusive in practice. The technique is not one that is easily mastered, as it takes two steady hands and precise control for the foot pedal. TIG is an acronym for Tungsten Inert Gas, but old timers sometimes refer to it as Heliarc welding. TIG really can do it all, and it is perfect for precision work. It breaks welding down to its bare elements and puts the welder in total control all of them. Like MIG welding, TIG uses a shielding gas. Unlike MIG, TIG uses a filler rod instead of welding wire. The filler rod is held in one hand while the torch is held in the other. As the foot pedal is pressed, an electric arc is fired from a tungsten electrode in the torch. The electrode is ground down into a pin point, so the arc can be pointed accurately at whatever is being welded. Tungsten is used as it has a melting point, about twice as high as steel. The farther down the pedal pressed, the more amperage is delivered, and more amps mean more heat. This setup gives the operator infinite control. Some machines have the option of heat controls on the torch for situations, where it’s inconvenient to use a pedal. The trick here is to hover the tungsten over the metal as you melt it with electricity and fill the void with rod, all while keeping the tungsten clean by not dipping it in the molten steel. Every time you dip the tungsten you have to pull it out of the torch and grind it back to a point. While I was learning I did a LOT of walking back and forth to the grinder. Learning to TIG is a bit like driving a manual for the first time, or maybe learning to juggle. It takes absolute focus and demands your full attention. Unlike Stick and MIG, this process makes next to no noise as you go along. When TIG welding steel, there’s a bit of a BZZZT when you start the arc, and then nothing but the hiss of the shielding gas leaving the nozzle. You’re totally immersed. Welding aluminum is a little noisier. but it’s just as involving due to the added difficulty of welding a material with half the melting temperature of steel. TIG forces you to be in the moment. It unifies your physical and mental processes until it’s all... zen. Learning these skills builds the confidence to tackle that crazy scratch-built dune buggy or chopper project. Replacing the rusty rocker panels by yourself no longer feels impossible. You can weld some obnoxious exhaust on your hand-me-down Chevy Celebrity. Hell, get good at it and you can even put a roll cage in a LeMons car and go racing. When you learn to weld you begin to see things in a new way, like seeing everything as mere assembly materials that make a complete idea. You’ll notice welds everywhere, and develop a new respect for the production processes of everyday things. Metal doesn’t seem as permanent after you learn to manipulate it. Once you gain the ability weld, you see steel more like a fluid that’s ready to take whatever shape you give it. 2 years ago Aaron Vick Starnes quit his well paying bank job to pursue inevitable poverty as an automotive writer. He has experience in automotive restoration, and currently works restoring and customizing cars. Follow him on Twitter @AaronVStarnes and check out his blog.